How does someone become a telemetry nurse? Whether you are a student planning for your future or an established professional intrigued by the idea of changing direction, it is always important to understand what you need to accomplish to reach your goal. To become a telemetry nurse, you must first become a nurse. 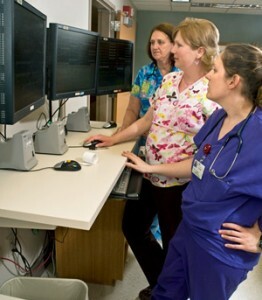 With experience, you can seek specialized training and even pursue advanced certification to become a telemetry nurse. of a telemetry nurse. Working as a telemetry nurse is a demanding job with little down time because each nurse cares for multiple acutely ill patients. What Education is Required to Become a Telemetry Nurse? To become a telemetry nurse, you must first become a registered nurse by earning your diploma in nursing, an associate degree in nursing or a bachelor’s degree in nursing. If your ultimate goal is to become a telemetry nurse, you may want to pursue the bachelor’s degree. Many hospitals give preference to nurses who have completed this more in-depth degree program when selecting staff for the telemetry, progressive care and step-down units. NurseZone suggests that you try to shadow or otherwise work with telemetry nurses during your studies so that you are familiar with this challenging job and have a head start in preparing for it. Once you pass the National Council Licensure Exam for Registered Nurses and become a nurse, read journals on telemetry and progressive care as you gain hours and experience in patient care. What Certification is Available for a Telemetry Nurse? Many hospitals require telemetry nurses to become progressive care certified nurses by passing the exam administered by American Association of Critical-Care Nurses. To sit for the exam, you must have an unencumbered nursing license and meet the clinical practice requirements by spending the requisite number of hours involved in the care of acutely ill patients. Telemetry nurses are expected to understand medication dosage and administration, patient monitoring protocols, and basic and advanced life support. They should also be prepared to recognize signs of respiratory or cardiac emergencies and know how to begin interventions to stabilize their patient. With America’s aging population placing an increasing strain the capacity of intensive care units, more and more hospitals are setting up or expanding telemetry and progressive care units for patients whose conditions are too serious for standard care, but not quite dangerous enough to justify intensive care. This shift in healthcare strategy is making telemetry nursing an in-demand specialty. If you are looking for a challenging, hands-on career that allows you to work with both patients and sophisticated medical technology, this is an excellent time to become a telemetry nurse.